The origins of bingo; where it all began. Bingo, as we know it today is a form of lottery and is a direct descendant of Lo Giuoco del Lotto d'Italia. When Italy was united in 1530, the Italian National Lottery Lo Giuoco del Lotto d'Italia was organized and has been held, almost without pause, at weekly intervals to this date. Today the Italian State lottery is indispensable to the government's budget, with a yearly contribution of more than 75 million dollars. In 1778 it was reported in the French press that Le Lotto had captured the fancy of the intelligentsia. In the classic version of Lotto, which developed during this period, the playing card used in the game was divided into three horizontal and nine vertical rows. Each horizontal row had five numbered and four blank squares in a random arrangement. The vertical rows contained numbers from 1 to 9 in the first row, 10 to 19 in the second row, etc.., up to 90. Each horizontal row had five numbers. No two Lotto cards were alike. Chips numbered from 1 to 90 completed the playing equipment. Players were dealt a single Lotto card; then the caller would draw a small wooden, numbered token from a cloth bag and read the number aloud. The players would cover the number if it appeared on their card. The first player to cover a horizontal row was the winner. A few miles from Jacksonville, Lowe came around a bend in the road and was greeted by the bright lights of a country carnival. He was ahead of schedule, so he parked his car and got out. All of the carnival booths were closed except one, which was packed with people. Lowe stood on tiptoes and peered over the shoulders of the participants. The action centered on a horseshoe-shaped table covered with numbered cards and beans. The game being played was a variation of Lotto called Beano. The pitchman, or caller, pulled small numbered wooden disks from an old cigar box and, at the same time, called the number aloud. The players responded by eagerly checking their card to see if they had the number called; if so, they would place a bean on the number. This sequence continued until some someone filled a line of numbers on their card - either horizontally, vertically or diagonally. This feat was marked by the shout of "Beano!" The winner received a small Kewpie doll. Ed Lowe tried to play Beano that night, but he recalls, “I couldn’t get a seat But while I was waiting around, I noticed that the players were practically addicted to the game. The pitchman wanted to close up, but every time he said, 'This is the last game,' nobody moved. When he finally closed at 3:00 a.m. he had to chase them out." Returning to his home in New York, Lowe bought some dried beans, a rubber numbering stamp, and some cardboard. Friends were invited to his apartment, and Ed Lowe assumed the pitchman's duties. Soon his friends were playing Beano with the same tension and excitement as he had seen at the carnival. During one session Lowe noticed that one of his players was close to winning. She got more excited as each bean was added to her card. Finally, there was one number left - and it was called! 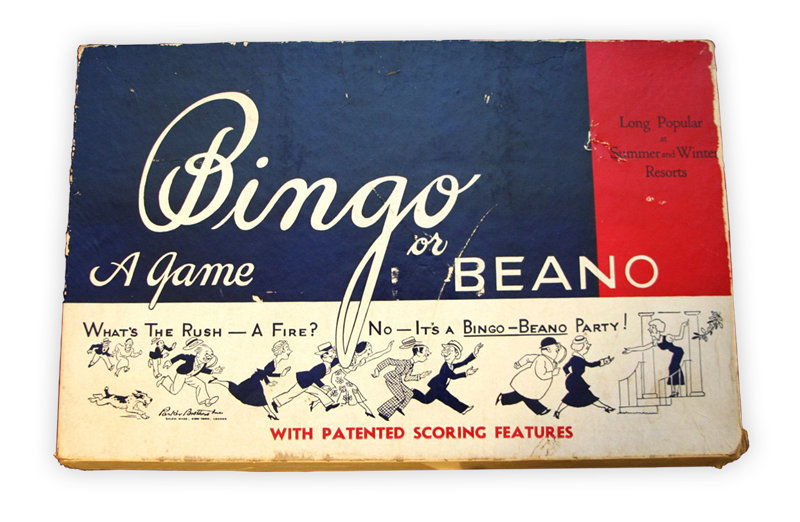 The woman jumped up, became tongue-tied, and instead of shouting "Beano," stuttered "B-B-B-BINGO!" Several months after Bingo hit the market, a priest from Wilkes-Barre, Pennsylvania approached Lowe. The priest had a problem in his parish. A fast thinking parishioner had come up with the idea of using Bingo as a way to get the church out of its financial troubles. The priest had put the scheme into operation after having bought several sets of Lowe's $2.00 Bingo game. However, problems developed immediately when it was found that each game produced half a dozen or more winners. 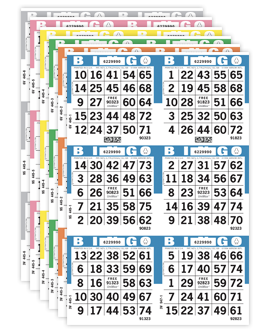 Lowe could immediately see the tremendous fundraising possibilities of Bingo, but at the same time, he realized that to make the game workable on this large of a scale, a great many more combinations of numbers would have to be developed for the cards. To accomplish this, Lowe sought the services of an elderly professor of mathematics at Columbia University, one Carl Leffler. Lowe's request was the professor devise 6,000 new Bingo cards with non-repeating number groups. The professor agreed to a fee that remunerated him on a per card basis. As the professor worked on, each card became increasingly difficult. Lowe was impatient, and toward the end, the price per card had risen to $100. Eventually, the task was completed. The E.S. Lowe Company had its 6,000 cards - at the expense of the professor's sanity! The church of Wilkes-Barre was saved and after it, a Knights of Columbus Hall in Utica, New York. Word spread fast - "I used to get thousands of letters asking for help on setting up Bingo games," said Lowe - so many that he published Bingo's first Instructional Manual, followed by a monthly newsletter called The Blotter, which was distributed to 37,000 subscribers. By 1934 there were an estimated 10,000 Bingo games a week, and Ed Lowe's firm had a thousand employees frantically trying to keep up with demand - nine entire floors of the New York office space, and 64 presses printing 24 hours a day - "... we used more newsprint than the New York Times!" According to Lowe, the largest Bingo game in history was played in New York's Teaneck Armory - 60,000 players, with another 10,000 being turned away at the door. Ten automobiles were given away. Bingo was off to a fast start, and at the same time, had reserved itself next to baseball and apple pie - thanks to Ed Lowe and the loss of Professor Leffler's sanity.